[Below are the four ‘main’ verses of the union song “Solidarity Forever”. Two other verses from the “original” have been deleted. These are the ones usually sung. The original was first published in the IWW Little Red Song book. There are a dozen very good versions on You Tube, but our favorite is the Pete Seeger version. The songs of justice have long traditions, and new ones are waiting, like the new world from the ashes of the old, to be born in 2012 in Chicago]. 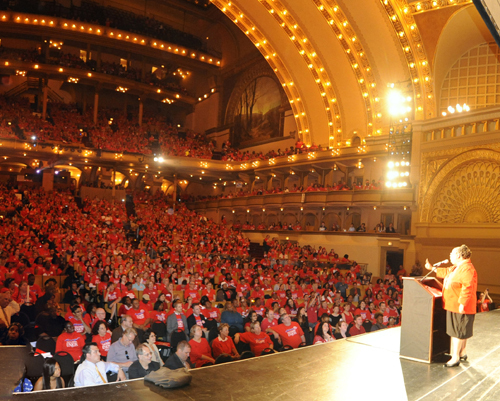 Chicago Teachers Union President Karen Lewis speaking to the crowd of more than 3,000 at Chicago's Auditorium Theatre on May 23, 2012. Substance photo by Graham Hill.The URL for the Pete Seeger version of Solidarity Forever is: http://www.youtube.com/watch?v=kYiKdJoSsb8. Anyone who writes a history of strikes by identifying every strike (and mass action) depicted in the photographs accompanying the Pete Seeger "Solidarity Forever" will get an eternal subscription to Substance. CHORUS Solidarity forever! Solidarity forever! Solidarity forever! For the Union makes us strong.